The Marquise Diamond, also called a navette cut, is classy variation of the oval cut with a history dating back to early 18th century France. This classic cut retains the 56 facets common to the oval cut but is elongated into a boat-like shape with pointed vertical ends. Although the cut is beautiful in its own right, the style of a Marquise cut diamond ring is also quite specific to its owner. A marquise cut is long and thin with the diamond set lower and closer to finger than most other cuts. This is an elegant style that will flow naturally on a lady with long slender fingers. It may not match as well with shorter and thicker fingers. On the other hand, the Marquise is an equally exceptional cut for earrings and pendants as well. Blue Nile is recommended for both quality and affordability as The online source for everything Marquise Diamond. Browse their exquisite Marquise jewelry collection, sort through 1000s of loose Marquise diamonds, or design your own custom Marquise diamond ring, pendant, or earrings. Blue Nile guarantees the lowest diamond prices on the market or they will attempt to match it. This is arguably the most important grade for a Marquise. Due to the thin and elongated nature of a Marquise cut, inclusions in a far more visible than in thicker cuts. Always try to aim for SI1 (Slightly Included 1st Degree) or better for the clarity on your Marquise cut diamond. 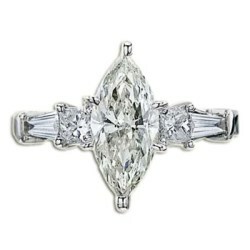 The nature of the Marquise diamond cut can potentially be an extremely important factor. The ideal length-to-width ratio for this diamond should be between 1.75 and 2.25. 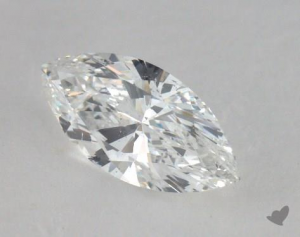 The farther a Marquise diamond cut is outside of these parameters, the more problems it will have reflecting light within the stone. This will cause shadows within the stone commonly known as the 'bow-tie effect' because of their shapes. However, within the 1.75 – 2.25 range, there should not be a significant issue with bow tie shadows so the exact ratio should be up to personal preference. Also, since most Marquise diamonds are naturally cut within this ratio, it is often not listed. Color is also an important grade for the Marquise Diamond. The highly reflective nature of this cut can increase the apparent color in faint yellow ranges (K, L, M) and even the low near colorless range (I). It is a safe recommendation to select your Marquise diamond at least in the G or H range (high end of near colorless) if not better. On the other hand, color preferences are also quite subjective and some customers even prefer the warmer colors. Another obvious exception is if you are searching for a fancy colored marquise cut diamond, which can be quite splendid in its own right. In the end, simply choose the color grade based on your own preference and what you perceive as a beautiful diamond. Apart from the splendid and unique appearance, a significant advantage of the Marquise diamond cut is that it maximizes the apparent size of the gem, making it appear considerably larger than its actual carat weight. In other words, you don't need a high carat weight in order to get a good sized Marquise diamond. The Marquise diamond (note the 'e' at the end) is commonly misspelled as 'Marquis diamond' when in fact there is no such thing as a Marquis cut. This is a common source of confusion because both 'Marquise' and 'Marquis' are two different French titles of nobility. However, Marquise diamond is the only correct spelling for this splended cut.